You don’t have to break the bank to add personality to your home. Summer is prime time to score deals on vintage and one-of-a-kind items. We’ve gathered tips for what to look for at yard sales, auctions, and thrift stores to add affordable style to your home. With a little know-how, you’ll gain first-hand experience as a second-hand shopping expert! 1. Window shop. Flip through your favorite shelter magazines and browse on-trend department stores to gain inspiration. When you have an idea of what you like, you’ll be able to easily spot your style (for a fraction of the cost) at a second-hand shop. Styles are cyclical -- tufted headboards gained popularity in the ’60s, but have made a comeback. You may just stumble upon an original, and save money, too! 2. Shop often. Consistency is key. Not every yard sale will be a victory, but keep at it -- you never know when you’ll stumble upon hidden treasure! One trick to finding a diamond in the rough? Visit thrift stores at the beginning of the week -- donations usually arrive over the weekend, so shopping on a Monday or Tuesday will give you the biggest inventory to choose from. But remember -- items are constantly dropped off, so visit often -- the thrill of the hunt is part of the fun! 3. Examine labels. Not sure if that vase is authentic? An antique’s factory mark can clue you into the age and the value of a piece. Smart phones are key for your thrifting tool box -- typing in a description (ceramic glazed vase, made in England, 1914, initials E.B.) will help you determine an item’s value in less than a minute. 4. Visualize. In the drab lighting of a thrift store, that $2 oil painting might seem lackluster. But imagine it on a shelf of your favorite home decor boutique. Visualizing pieces in a new location will help you determine if it’s something to pass on -- or purchase. 5. Add a pop of color. Thrift stores and yard sales were made for statement pieces. You may enter looking for a desk, but come away with some charming wall art for just pennies. Keep an open mind -- you never know what might catch your eye! 6. Find its function. That antique kettle may be charming, but why do you want it? Do you have space for it? Thrifting can lead to tempting purchases, but if you don’t have a home for each item you purchase, you’ll just add to the clutter in your home. Stick to pieces with clear style and functionality. 7. Look for good bones. A mid-century side table might be a dated woodgrain, but would look dazzling after a coat of white paint. Know the style of furniture you’re looking for -- do you gravitate toward mission-style, or do you like intricate Victorian pieces? 8. Think outside the box. That vintage dresser could be a charming buffet with some new hardware. Or turn it into the perfect bookshelf for your office by removing cabinet doors. Thinking creatively will help you score one-of-a-kind furniture at a fraction of the cost. The bonus? Usually older pieces are sturdy and built to last. 10. Buy a basket. 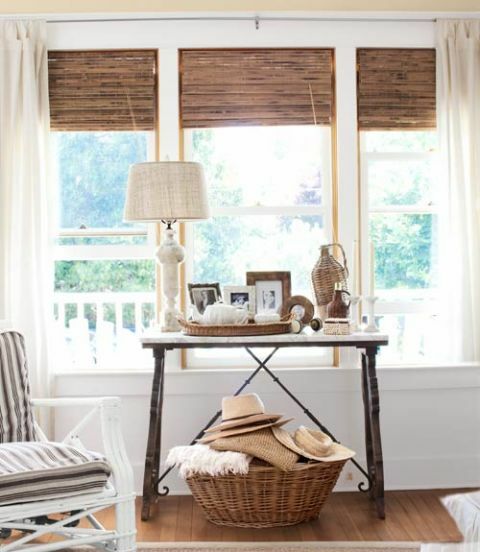 Wicker baskets add function and style to your home -- and can be easily spotted at second-hand stores for a fraction of department store prices. Roll up throw blankets and place in a basket by the couch. Baskets also make great homes for magazines -- or wayward toys that seem to clutter the living room floor. Smaller baskets are fabulous organizers for shelves in bathrooms and bedrooms.